Welcome to part three in a multi-part series meant to entertain and astonish you with the history of gaming on computers. Yes kid, there was a time when games didn't require the latest 3D accelerator cards and teams of designers. All it took was access to a computer, a little knowledge, and a little "hacker" spirit to get going and do it your self. So everyone fasten your seat belt while Sherman sets the Wayback Machine for a few different stops this time. This installment will document advances in computing itself, that set the stage for gaming in the 1970's. Our first stop is a return to MIT and the founding of project MAC in 1963. 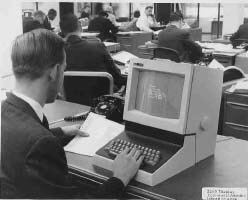 The hackers coding about the TX-0 and the PDP-1 were not the only ones to realize the advantage of having an interactive computing environment for people to use. Unfortunately, computers were still to expensive (and to large) to provide that type of experience to everyone. And while the "priesthood" batch processing was out of the picture for the TX0 (and later Tx2), and PDP-1 mainframe/mini's, people still had to sign up for slots of time to use them. Fortunately, one of the hackers' mentors - John McCarthy had already suggested a viable solution back in 1957 - Timesharing. Timesharing was the idea that multiple people could use the computer's resources at once, all with the illusion that they were the only ones on the computer. This was done by allowing several users to connect to the computer (originally through flexowriters, later through teletype (tty) machines, and finally through CRT based terminals). The computer would then jump from one person's process to another, temporarily halting the other people's. With switching done fast enough, the illusion of each person having sole access was maintained. The idea is important enough, that it is used in similar form to this day with operating systems that provide multi-tasking. Ever wonder how your PC can be running it's graphical interface, plus a word processor, a web browser, an email client and several other programs at once? The idea of rapidly switching back and forth between each program is how. Timesharing had been experimented and implemented on a small scale at MIT and other locations, but it wasn't until Project MAC was created in 1963 that it had a real advancement. Project MAC (which stood for both Multiple Access Computing and Machine Aided Cognition) and its mission was to develop a computer system accessible to a large number of people, and to exploit the computer as an aid to research and education. The research being talked about was primarily Artificial Intelligence work (hence the Machine Aided Cognition), and as such another of the hackers' mentors hopped on board. Marvin Minksy came on board of the project, and brought a bunch of the hackers with him. Yes, many of them now got paid for their work. The result was a success, and many concepts of timesharing systems were pioneered. Also pioneered were many of the concepts used in today's operating systems. Operating systems at the time were almost non-existent in today's standards. People had to write programs (in assembly language) for just about everything - which is where the MIT hackers originally excelled. If you wanted to load a program, first you needed to enter a program called a "loader" for example. The first "operating systems" tended to be small programs that were used in the priesthood batch processing environments and allowed them to load the processes and run them in order. This later developed in to allowing most of these programs to be run in a timesharing type manner, with the batched processes to be loaded all together in to memory and switched back and forth. With the advent of timesharing and it's user based interactive outlook however, operating systems had to take on new functionality. They not only needed to be able to switch between programs, but had to control i/o to terminals, and dole out other system resources such as mass storage. A new operating system by the name of MULTICS was started at MIT that while not as successful as hoped, would go on to influence operating systems to this day (Unix was a result of MULTICS after Bell Labs pulled out of it's partnership with the MULTICS project buy used many of it's concepts). An important feature of MULTICS at the time, one which would not become more common until the 1970's, was the support of the new CRT based Video Display Terminal (VDT), which was essentially a cathode ray tube housed with a keyboard that was directly linked to the mainframe. Using only "character" based graphics (for displaying text or simple pre-defined graphics, such as a cursor), these were essentially more limited than the crt displays housed in the main consoles of the DEC computers used to play Spacewar. However, they were in essence a reflection of the new environment of timesharing systems where the resources were shared and could not be monopolized by a single large program that used a lot of the processor time for the control of the display. That didn't stop development of these VDT's however and they continued to evolve as different video terminal formats (methods for the computer and the terminal to communicate and display information) continued to develop. In the long run Vector displays would go on to have an impact in the arcades, while CRT based VDT displays would go on to have an impact in the early years of micro computing. As the technology of displays and timesharing continued to spread (commercial systems such as those by DEC eventually came with timesharing operating systems and VDT's) across the country, timesharing environments became more common on college campuses across the country by the late 60's and early 70's. And this environment where multiple people could not only be on the system programming at once but also share resources such as files, set the stage for the next evolution of gaming on computers. But first, a jump in the wayback machine to Dartmouth College in the year 1964.